We have also added a small Bait and Tackle shop available 7 days a week. there is a good stock of Furzebray winter boilies + Sticky Baits & CC Moore. and a good range of terminal tackle / gas hoody's / and many more regularly used pieces of equipment so please call at the shop or phone Tony for further information on 01769572653. As for the fishing well is has been a good summer with many anglers breaking their PB. Charlotte was out at 43lb earlier in the year but she spawned out very well and dropped to 29lb and if she has done what the other big fish that spawned have she should be well over 40lb again now. Now for a list of the big carp that have been out lately. Starting with Clover landed by Dan Staves at 36.6lb surely our next 40lb carp!!! Peanut 34lb / Blackspot 33.8lb / Orange spot 34.12lb / Drop Scale 34.8lb / Star 31lb / Mint Common 29.12lb There are several more 30lb + carp in the lake and with the number of carp coming out between 27 & 30lb how many by next summer!!!!! 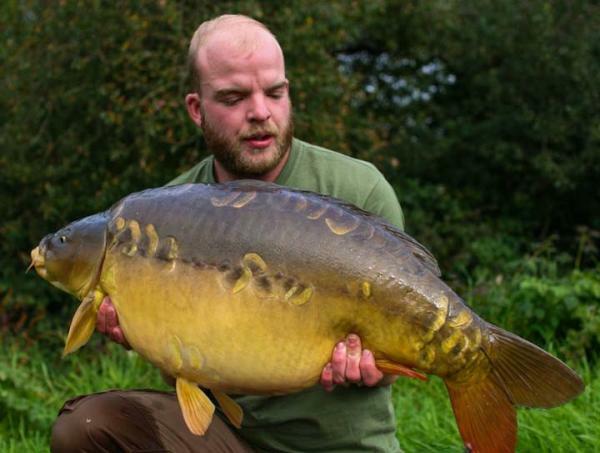 Check out some of the stunning carp landed by viewing our Facebook page and follow the latest news reports. Willow lake has fished well this year and the carp are growing on well so we are offering winter tickets for December January February for £75 with unlimited fishing subject to available spaces booking is still required. Our Holiday lodges are ever popular throughout the year so if you would like a fishing holiday and try to catch one of our big Carp check out the accommodation page on our web site, but please please do check the availability of the fishing before booking call 01769572653.